This level has medium difficulty. 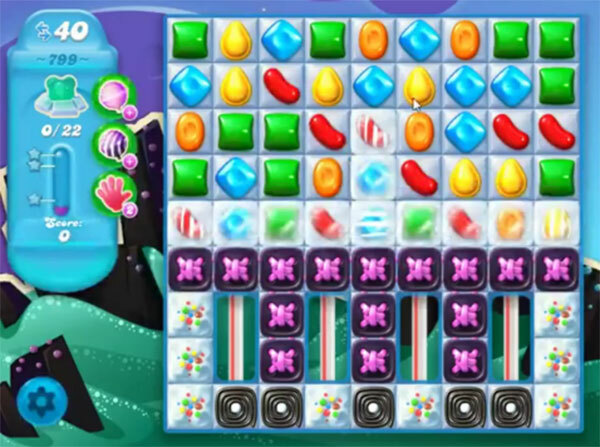 For this level try to play more from the bottom part of the board to shuffle the candies. Or play near to blockers to break them. Combine special candies with each other to break more snow blockers to find the bears. I think this level needs tweaking!!! It is NOT med difficulty!!! I used what power ups I had, and still nothing…same I’ve always said about CC if you have to play more than a dozen times NOT FUN. Time for a break, because I’m just frustrated, and this is just a STUPID game!!!! sometimes i think you only have 12 levels one for each month because that’s how long you make us play a level. maybe you could add some free boosters for people on a fixed income and can’t afford to buy to get through the level. love the game just not the same level for 30 days. [boring]. 20 days so far on level 799 last month level 798 2 months. just not fun anymore.